Learn how to make an old-fashioned evergreen wreath for your home this Christmas using natural elements in your yard and without a wreath maker. One of my favorite things about the pioneers is they knew how to use what they had on hand to create what they needed. Making an evergreen wreath at home with the items you’ve got available is about as old-fashioned as you can get. Even if you don’t live where there are evergreens, see what you do have lying around you could refashion into a wreath. Tie some rope up into a circle and decorate it. Use moss or tumbleweed on twisted branches with a bow. Get creative! You can subscribe via RSS and receive every episode for free. Wire– You’ll need some floral wire, preferably in green so it hides against the evergreen boughs. I’ve been reusing the same floral wire for 4 years now. Evergreen Boughs– the best choices are cedar, pine, and fir. Hemlock is pretty and lacy, but it dries out and drops it needles much faster than other evergreen varieties. Other foliage or embellishments-look for contrasting bushes or plants in your yard or forest. Lemon cypress and the branches of a burning bush without the leaves but the small berries were natural elements I used to decorate mine. Pine cones are another great natural item you can gather and attach. If you don’t have evergreens growing on your property or somewhere you can gather them, check with local nurseries, Christmas tree farms or Christmas tree lots. Many times they trim the trees and will have extra boughs for purchase or for free. Ask a neighbor if you can trim some branches from one of their trees. You really only need about 6 to 8 boughs and smaller lower hanging limbs are best so you can still bend them into the wreath form. Gather up all your supplies and lay them out. If some of your boughs are naturally curving, match the curve to the circle of your wreath form. Secure your floral wire around the wreath form by wrapping it around a few times to form an anchor. Lay down the first bough and secure it at the top to the wreath form by wrapping the wire around it, then go halfway down and wrap it again, snugging it tightly to the form. Choose your next bough and tuck the end of the branch underneath the first bough, so the foliage hides the end of the bough. Continue this, wrapping each branch to secure it to the form, all the way around. Once you have a base of boughs covering the form, stick in smaller branches where needed to fill in any holes. The needles from the evergreen act as great anchors and I never glue any of my other pieces on, I just stick them in between the other branches. Place your other embellishments in groupings of odd numbers. Our eye naturally looks for a place to rest, so using odd numbers makes a visually appealing decoration. I put more embellishments around where I put my bow to frame it. 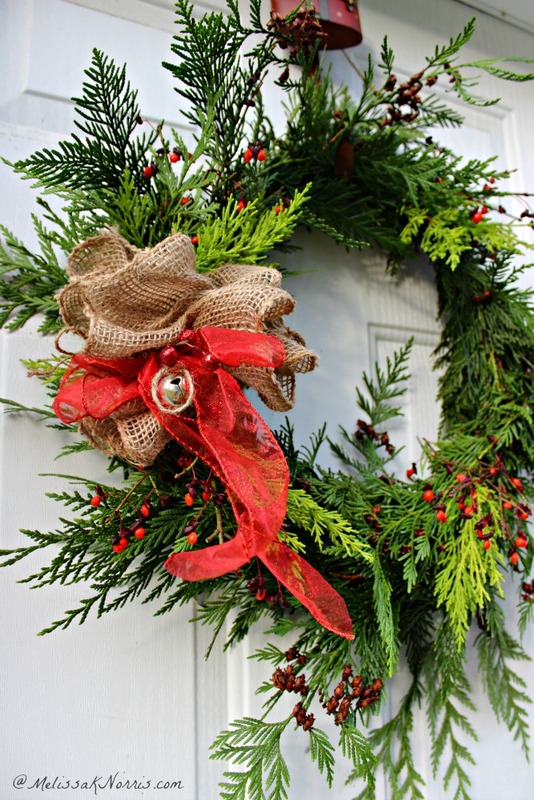 Hang outdoors and your wreath will last for months in cooler climates. Here in the Pacific Northwest mine lasts from November clear into February. 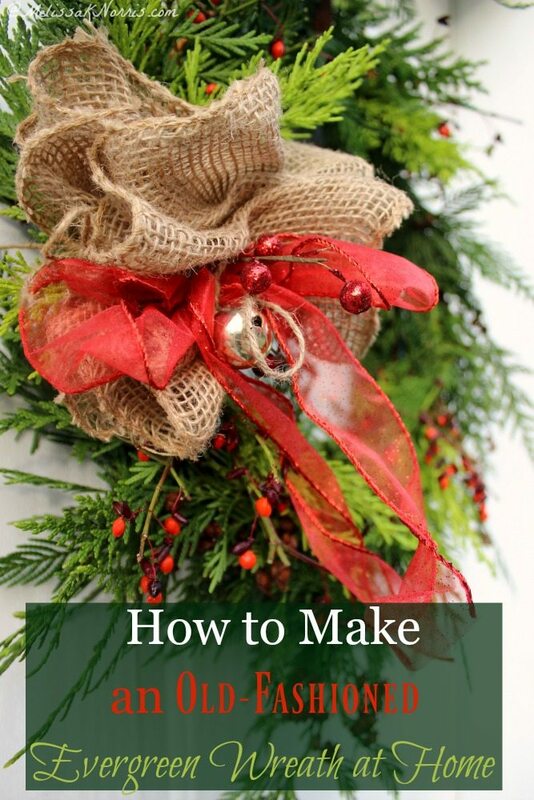 If you don’t have a wreath form, you can also make this evergreen swag at home.